The stomach flu is caused by a viral infection and can leave you feeling weak, dehydrated and tired. The stomach flu also has other unpleasant symptoms, such as diarrhea, vomiting and nausea. 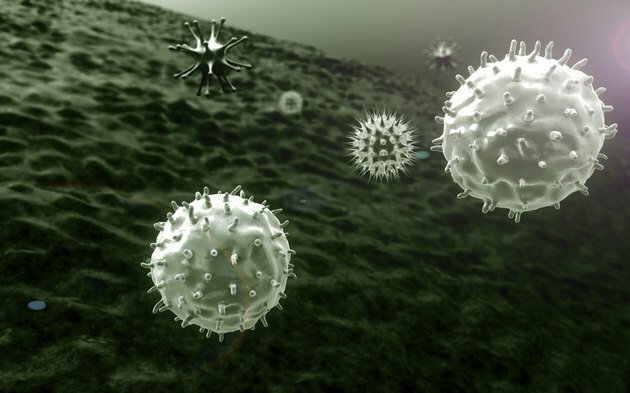 A variety of viruses can cause stomach flu, and it can affect children as well as adults. One of the effects of the stomach flu can be temporary weight loss. Stomach flu symptoms can range in severity from mild to severe but generally consist of abdominal pain, stomach cramping, diarrhea, nausea and vomiting. You may also experience other symptoms such as chills, muscle pain, excessive sweating, clamminess, joint stiffness and weight loss. Your health-care provider may perform a physical exam to check for sunken eyes, low blood pressure and ask if your mouth feels dry or sticky. This can indicate dehydration. Weight loss associated with the stomach flu is usually temporary weight loss. Sometimes this type of weight loss is referred to as unintentional weight loss, which means that you did not exercise or diet to lose the weight. If any weight is lost, most of it is only water weight. You may lose water weight due to the volume of water you lose with diarrhea and vomiting. You may also notice a slight weight loss due to the stomach flu due to lack of appetite while you are feeling ill. With a combination of lost appetite, diarrhea and vomiting, you may lose a few pounds. Typically, the weight will return after normal eating habits resume. Symptoms of the stomach flu may appear within four to 48 hours after contracting the virus. Most children and adults begin to feel better within a few days. The amount of time you will suffer from stomach flu will depend on how your body responds to the viral infection and how quickly the virus gets out of your system. If symptoms occur for more than several days, seek help from your physician. One common concern about the stomach flu is dehydration. You can easily become dehydrated when you have the stomach flu, and it can be worse for those who have weakened immune systems, the elderly and infants. Consuming sugary beverages such as sweetened tea, soda or juices with added sugars can make diarrhea worse, which can cause you to become severely dehydrated. Avoid all types of sugar, even if the sugar is in food, such as a candy bar or dessert item. Do not gulp liquids down, no matter how thirsty you become. Gulping liquids can cause you to vomit.